Up a little late last night again, checking out Lonely Planet's incredible,lively, and often informative travel forums. Not too long now. Last night, I stayed up a little past my bed time trying to conquer a little more space on my to do list. Went to bed at 3:30am with full intentions to sleep in a little. My plan went pleasantly sideways when Marsha brought me latte in bed around 9am. My wonderful woman. I love her so much. So, then, I was up and the day was a busy representation of my wacky, diverse life. Today, I: had a meeting with the local police about on anti-racism project, gut my teeth cleaned at the dentist, troubleshooted a virus issue for a new client, changed my car insurance, bought malaria pills, cleaned my house a little, and now I am writing this post on my Tablet PC. Some of Marsha's friends are coming over in about an hour. I am one of those people who needs 8 hours of sleep. Right now, I am feeling the lack of it! Today, Marsha and I visited my good friend Jan Petrar at Jan's travel agency, Jungle Travel, to purchase travel insurance for our trip. Jan is a wonderful person working very hard at her business in a challenging overall industry environment. Thanks Jan! I am getting really excited about this trip. On week to go and we are on the plane! About once every month, I trundle off to the Kamloops Chamber of Commerce board room for an early morning business networking meeting called the Power Hour. Its been about a year that I have been participating. And I still do not know how effective I have been. I certainly have not spent enough time yet helping the other folks that participate grow their business. I don't want to worry about how much business growth I get out of the Power Hour. I want strong relationship,but, as far as business goes , well, first things first. And its far more important to me to develop strong relationships, and create great work, then to mindlessly and soulessly chase dollars. Not that any one else around the table does that. Its just easy mindset or emotion to fall into to become jealous, competitive, or too group dependent. I have got to be a more productive and effective member of this group of great people. This evening, Marsha and I had a visit with our good friends Larry and Yukino Maki. Larry has introduced me to so many good things in the online world. Larry introduced me to Metafilter and Boing Boing. Larry showed me how to emulate the classic arcade game Asteroids on my PC (I love Asteroids). The Internet is both a passion and a career for both of us. Yukino is such a classy lady. They both make me feel very lucky that they are my friends. And, four months ago, they brought the roly poly incredible Max Maki into the world. 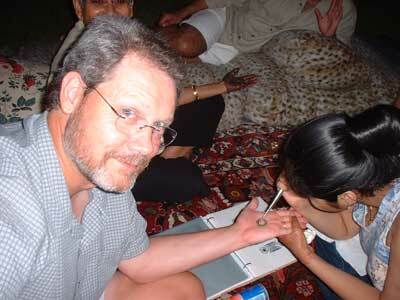 Brad Kincaid having Mehndi done at my wedding. We have come a long way brothers! Well, here it is. My new blog site all about Marsha and my adventures in India. 9 days to go before we are on a China Airlines flight via 7 hours in Tapei to Bangkok. After 4 days in this Asian metropolis, onto a bigger metropolis, New Delhi. Lots to tie up before then. Excited. Exciting.